Meanwhile, all this has fortunately become a ‘no-go’, even though the returning to the historical-classical cocktail as the sophisticated fundament for modern creations could not eradicate such drinks entirely, but of course in renowned bars you will look for such drinks in vain. Even bars in the Tiki tradition nowadays tend to rely on style and sophistication while interpreting their cocktails entirely different from the description above. 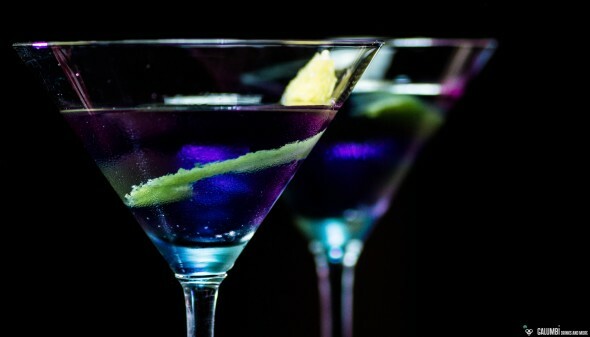 Nonetheless, the blue cocktail has become something like the archetype of a cocktail from this darker chapter of bar history. So today you won’t find many drinks with Blue Curacao or blue colour on bar menus at all (though the real Curacao of Curacao is also available in the blue variant and its taste is absolutely fine). Anyway, today’s article is about a blue drink: The Blue Moon Cocktail is closely related to the history of the violet liqueur Crème de Violette and the Aviation Cocktail. The latter is a classic which disappeared for a long time from the scene but today certainly will be the most famous drink with Crème de Violette. By contrast, the Blue Moon cocktail is far less known and in the vastness of the Internet you will find really gruesome concoctions under that name. Of course they have nothing to do with the Blue Moon Cocktail I’d like to introduce here. Crème de Violette enjoyed a huge popularity in the 1890s but vanished at least by the 1930s from the production pallets of the major manufacturers, so cocktails made with Crème de Violette disappeared from the scene. Since the cocktail renaissance of the new millennium Crème de Violette once again is available at many stores and liqueur shops. Another available variant is the Crème Yvette. Basically, Crème Yvette is also a kind of Crème de Violette, but in addition to the subtle aroma of violets you can find citrus, spice and vanilla notes inside. The Blue Moon Cocktail I’m presenting here is adapted from Hugo R. Ensslin’s 1917 recipe and comes with Crème Yvette, but it can be mixed with Crème de Violette as well. Thus it is similar to the aviation, but instead of Maraschino it relies on vermouth and receives an additional component by Orange Bitters. If you like the Aviation cocktail, the Blue Moon Cocktail is a ‘Must-Try’! It is fundamentally different, though, but a real treat! Preparation: Stir all ingredients on ice in a mixing glass and strain into your pre-chilled glass. Mr. Ensslin now tops the drink with a little bit of red wine. I have added another dash of Crème de Violette. Buying Sources: gin and vermouth can be found in specialist shops and well-stocked supermarkets. Visiting a specialized retailer or ordering online might be necessary in order to get some Crème de Violette or Crème Yvette. The same applies to orange bitters. This entry was tagged Creme de Violette, Creme Yvette, Gin, Noilly Prat, Orange Bitters, red wine, Vermouth.